On May 12th 1897 a public meeting was held in the lecture hall of the Guille-Alles Library attended by the Lieutenant Governor General N. Stevenson and the Bailiff to consider the best means of commemorating Her Majesty Queen Victoria's Diamond Jubilee. The idea of a statue originated at a subsequent meeting called by his Excellency the Lieutenant Governor. A public committee was formed shortly afterwards to plan and carry out the work. The total cost of the scheme amounted to £730, collected from 2989 subscribers. All harbour dues and local charges were remitted by the authorities, and the freight refunded by the South-Western Railway Company. Efforts were made to have the unveiling performed by a member of the Royal family but these were unsuccessful. The inauguration was carried out by His Excellency Major-General M. H. Saward, R.A., the Lieutenant Governor, in the presence of the Bailiff of the island T. Godfrey Carey and a large gathering of the public on March 1st, 1900. The unveiling was not as grand as that for the Albert Statue (unveiled 8th October 1863) but it was reported as a festive occasion as it coincided with the relief of Ladysmith [during the Boer War]. 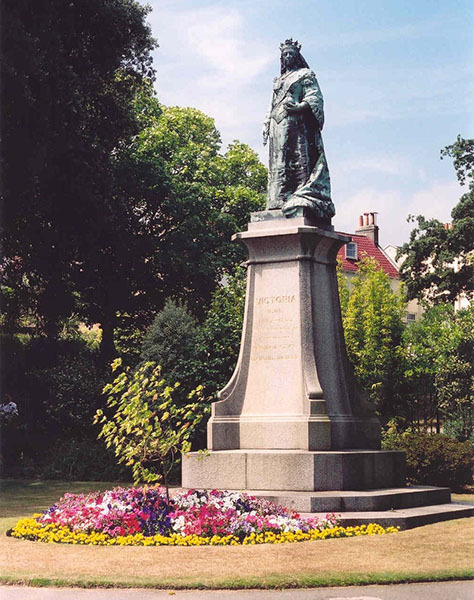 On the 9th May 1900 the States resolved to accept the statue and to be responsible for its care. It is now a Protected Monument. The statue is bronze, by the well-known nineteenth century sculptor C. B. Birch, A.R.A. It is a replica of those erected at Aberdeen and on the Thames Embankment. It was also cast at the same foundry by Messrs. Hollinshead & Burton, of Thames Ditton, Surrey, on July 15th 1898. Queen Victoria is portrayed in Imperial regalia with orb and sceptre. The base of the statue is Guernsey granite from Mont Cuet. It was designed by Mr T. J. Guilbert, States Engineer. Mr W. Stranger, of St Sampsons, was the contractor for the construction. The base is a semi-octagon or diamond shape, so as to represent the anniversary it was designed to commemorate. The statue is 8ft 6in high the pedestal 13ft 4 in. The weight of the statue and stone work is estimated at 25 tons 17 ¾ cwt. Victoria R. & I., 1837 - 1897. Erected by Public Subscription in commemoration of Her Majesty's Diamond Jubilee.